The common theme of this year’s Jubilee Training Conference was “Raising up Son’s & Daughters of the Kingdom / Making Disciples / Kingdom Ambassadors”. It makes no difference what we are doing in our churches if we are not making sons and daughters, kingdom ambassadors / disciples. Jesus mentioned the church only 3 times, but the Kingdom of God over 100 times. We are to be building God’s kingdom not our churches. The church is Jesus’, He commissioned us to minister to people. If we will invest in hurting people, the church will build itself. Andrew Wommack, Jack Taylor, Duane Sheriff, and many other anointed men and women of God challenged the church leaders and ministry teams to become mature bodies, healthy churches with a kingdom focus, to become safe communities in order to make a difference in our sphere of influences. We are grateful that most of our team was able to attend! We came home with fresh revelation and resurrected hope and excitement! We would like to personally thank Duane Sheriff, Pastor Lee Armstrong, and the Victory Life Church Family and staff for always providing some of the best Spiritual training in the world. Twice a year you guys pour yourselves into us, not only through incredible teaching all focused on making us more equipped as leaders, but by demonstrating and molding it to us so perfectly well…. So glad both Heather and Stephanie were able to attend this year’s Jubilee. Both are close to completing two years of drug court and have conquered major mountains. Both stories are posted on the web site and they are included in the short video testimonies on the web site www.deliveredfrommeth.com. u’ll be encouraged and blessed by both stories. 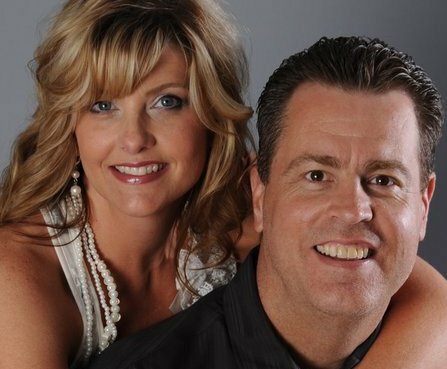 You’ll be tremendously blessed by both Pastor Steve and Pastor Stacy. Invite friends and family and help us spread the word. This will be first of many visits. Pastor Jason of RAW Church is going to team with us in the near future and do some two day services with Pastor Steve and Stacy...Resurrecting the Men of the Kingdom, and Bringing Up the Women of the Kingdom, into their proper places! Be in prayer that God uses this to impact Duncan. We recognized Heather Phillips as project manager of Recovery Home missions and outreach. 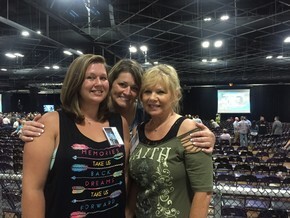 Heather's story will inspire & encourage your hope that with God all things are possible, it’s is posted on our web site at www.deliveredfrommeth.com click on the Heather & Stephanie story. She has climb major mountains holding hands with Jesus these past two years and is accomplishing things that seem impossible to many others. Her story will bless you! 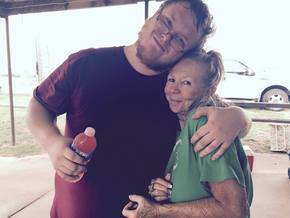 We would like to honor Erik Hansen for his loving servant’s heart and the example of love and respect he displays. Erik has been with us for over two years and he has grown so much in the Lord; he truly loves and lives for Jesus! 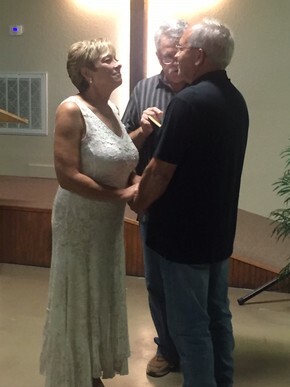 Floyd Jr. & Kelly Neeld said I do this month in an informal marriage ceremony. We pray for their continued walk with the Lord be fruitful! 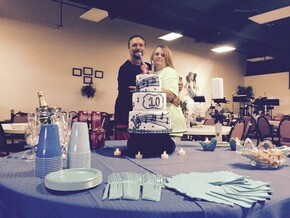 Darlene & Johnny celebrating their 10 year anniversary. This come close to never happening more than once, Johnny was flat-lined once from a drug over does and God brought him back to life. 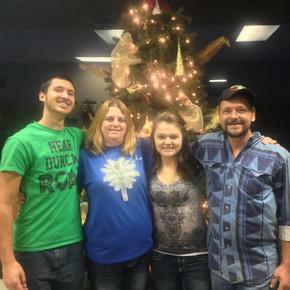 Now their family is restored and serving God with all their grateful hearts. Posted on the web site are 10 short stories of people whose lives have been miraculously transformed by the love of God. Johnny, Darlene, and Joey, Johnny’s son are among those. Go to www.deliveredfrommeth.com click on short video testimonies. You’ll be blessed. God restores the family! In The Recovery Church efforts to build strong women warriors for God’s kingdom, we want to teach our women how to love themselves... Love from others is a wonderful feeling but self-love is the BEST feeling! Self-love allows women to appreciate themselves and the value they add to the world without the need for a cheer leading squad behind them. Self-love means knowing what they like and being comfortable in liking those things. We are on a journey to animate and color the scriptures, in other words to bring LIFE to the black and white pages of the Bible. Women are never too old or too young to learn these lessons. The earlier they start, the stronger they’ll become! We are understanding that we can never give the love that God intended us to give others, until we learn how to love ourselves! An unloved woman will only bring grief to the one she marries, Proverbs (30:23), while a nagging wife is no better (21:9, 19). Also, women need to understand and acknowledge in their heart and souls that: Isaiah 54:5, “thy Maker is thine husband; the Lord of hosts is his name; and thy Redeemer the Holy One of Israel; The God of the whole earth shall he be called” . The carnal, natural flesh of mankind is NEVER to be honored! We are to submit and honor God in ourselves by recognizing and honoring God in our husbands, children, friends, co-workers, sisters and brothers in Christ, etc. If we are not to associate with a person who cannot control his temper (Proverbs 22:24-25), certainly we should not marry him either. Many battered wives could say “Amen” to this wisdom. True Wisdom has to do with becoming skillful in honoring God in our lives, in our husbands, and raising our children, handling our money and conducting our sexual lives, going to work and exercising leadership, using words well and treating friends kindly, eating and drinking healthily, cultivating emotions within ourselves and attitudes towards others that make for peace.. In matters of everyday practicality, nothing, absolutely nothing, takes precedence over God. This is the journey of our women’s life groups. Invite friends or family who are serious about traveling this path! Not pictured are Sue Neeld, Debbie Cox, Sandy Riddles, and Stephanie! 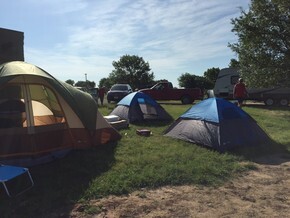 In August we had our first every weekend lake service – camp out. Many of our kids have never been camping, for that matter some of our adults haven’t either. Even though it was extremely hot, we had a blast, the pictures don’t really do it justice. 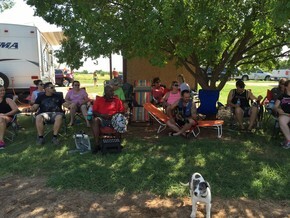 We’d like to thank Franky, Sue, Richard, and many others for bringing trailers, cooking all the food, taking care of all the kids, and for all the church that made it to our Sunday morning service…. The kids had a blast with all the water toys, jet ski, etc. We have many more trips planned next year. We had several one day lake trips this year and each were huge successes, even the trip to Murray that got rained out. Building family and learning how to enjoy life together, and thanking God for all the rain by enjoying it. Thank you Father for providing so we can enjoy you through Your creation….My wife Debbie says we need to learn how to enjoy God and just chill-out! Debbie still has a powerful work going on inside our jails. She is teaching the ladies how to believe and receive like let children, all the good that God has to say about us as our Father. She has tapped into creative ways of bringing God’s word alive in their hearts through color. We are to animate, bring to life God’s word. We are to be living epistles, full of God’s life and color. Would you rather look at a black and white picture, representing the letter, or a colored picture, representing the spirt? Remember it is the Spirit that gives life, the letter kills. 2 Cor. 3:16 says, “He has made us ministers of the new covenant, not of the letter but of the Spirit; for the letter kills, but the Spirit gives life”. We have three 4-day Kairos coming this winter. One at Mable Bassett women’s prison, one at Lawton, and one at Holdenville men’s prisons. We spend 4 days on a life journey with 45 inmates inside the prisons. We will be needing to raise funds for these trips if any of you are able to help. Debbie and I are still doing monthly ministry at Cushing and Holdenville, and soon be adding Lawton. In closing we would like to express our deep and sincere thanks to all our partners, in the many different ways you partnered with us, you too have been part of what God has, is, and will continue to do bringing His light into the dark and broken lives of the sphere God has assigned to Recovery Church Ministries. May God continue to richly bless all you put your hands to do! Loving God-Loving People-Serving Both-While Serving Our Community. Changing Our World One Heart at a Time!